Both the joy and annoyance of knowing someone writing a book is the anticipation. As an author I know the work, struggle, and excitement of producing a book. The time lag between the emotions of writing and the actual publication. Then the revisiting those emotions. When you know someone else going through these things the empathy is strong. So is the joy when that book is given to the world. 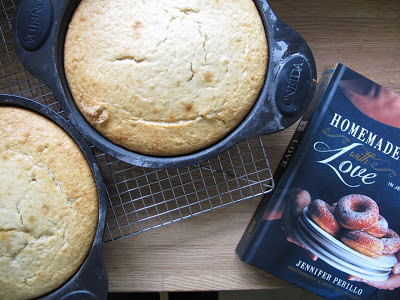 Jennifer Perillo recently published her first book, Homemade with Love. A testament to her from-scratch cooking as much as it is to love. It is filled with both stories and good food, the kind that make you wish you had doughnut pans and a food processor and extra long arms to hug everyone. I've had the book for about a month now and have made at least a half dozen recipes (including the incredible Golden Vanilla Birthday Cake seen above and currently covering half my cake stand). All have worked wonderfully and tasted like they cared about me. The book is, of course, tinged with both happiness and grief. This is the book Jennie always wanted to write. And then her husband suddenly died, plunging her and her girls into an unimaginable world. She writes of her grief in snippets in the book (more so on her blog, In Jennie's Kitchen). What you see in the book - even in the photography - is the light that comes from food, from making and sharing food cooked with love. And that light can shine through grief. One day I hope to meet Jennie in person, to cook with her and laugh over wine. I have a feeling she has a lot to teach me - about honest motherhood, food, and dreaming big. We can talk writing and 5 year old girls. And I will toast her and this wonderful cookbook, one of my favourites in a long while. Take some time today to laugh with your partner and share a piece of homemade cake.